Paul Guiragossian was born to Armenian parents in Jerusalem in 1926 and raised by his mother, Rahel. Rahel worked for a number of boarding schools, which provided education for Paul and his brother. At the age of 7 Paul returned home to live with his mother, often working during the summers to help support his family. Despite his mother’s concerns about his passion for drawing he enrolled at the Studio Yarkon in 1942 and began his studies. By the late 40’s his charcoal drawings showed an instinctive talent for capturing the faces of friends and family whilst his outlined but confidently sketched figurative drawings in ink, show a tendency towards the modernist works of Matisse and Picasso. 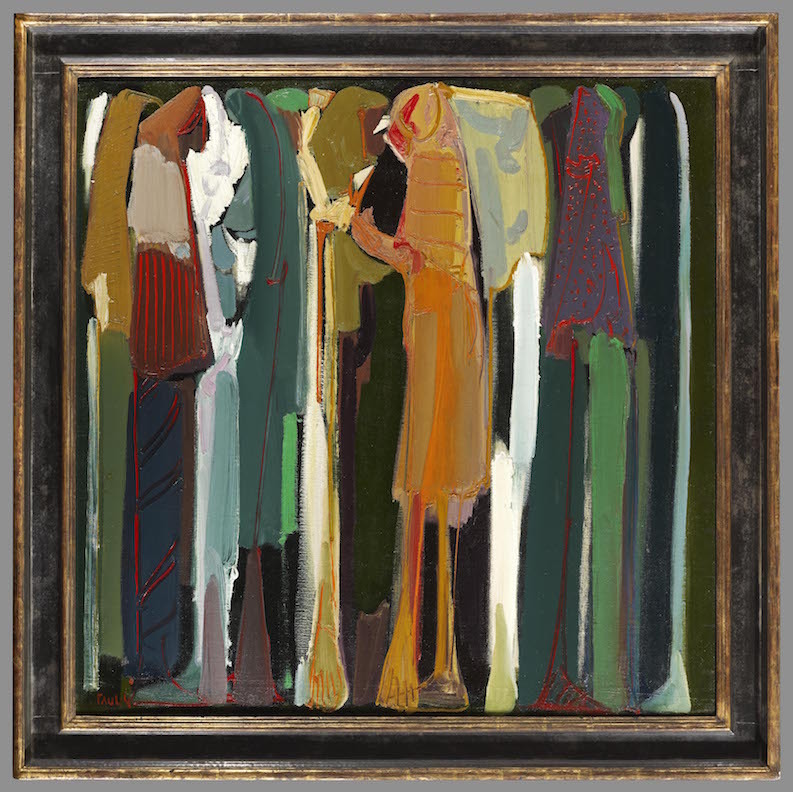 These simple compositions were to develop into groups of figures, sometimes appearing conspiratorially close together, heralding the subject matter of his later works in oils.Guiragossian eventually moved to Beirut, later gaining Lebanese citizenship. There he met his wife, Juliette Hindian, who was also a young painter and his first student. They married in 1953, and a year later Paul had his first solo-exhibition at Galerie La Palette in Beirut. The early half of the 1950’s saw Guiragossian continue experimenting with style and subject-matter, sometimes using blocks of colour to form abstract landscapes, whilst always returning to his figurative sketches drawn in ink. Broad and confident brushstrokes in his oil painting allied with an exceptional eye for colour began to emerge as did his portrayal of mother and child in much of the work from the mid ‘50’s. Paul and Juliette remained in Lebanon until 1957, when Paul received a scholarship to study at the Academy of Fine Arts in Florence. Upon his graduation from the Academy, he spent a number of years engaged in further study and painting in Paris and later New York, after which he returned to Lebanon. Guiragossian eventually moved back to Paris from 1989-1991, resulting in a solo exhibition at l’Institut du Monde Arabe in 1992.His wife Juliette is often cited as his primary support. In addition to being his wife and the mother of his six children, she was his muse, managed his many exhibitions and acted as his studio assistant undertaking tasks such as the stretching and preparation of his canvases. In the ‘80s his eldest son Emmanuel returned from Germany to work with his father and took over most of these responsibilities.Guiragossian emerged as one of the most important modern Middle Eastern painters of his generation, and received a state funeral when he passed away in Beirut in 1993. His frescoes, sculptures, stained glass windows, mosaics, illustrations, and of course his paintings, primarily centre around renderings of the human condition and form.